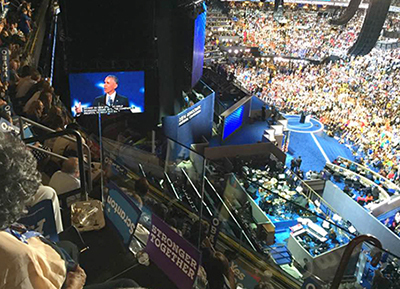 The Democratic National Convention took center stage for many union members last week in Philadelphia, with four days of addresses from top politicos (catch those you missed at the DNC website, or read coverage at Politico, Democracy Now, or the Washington Post.) Hillary Clinton became the first woman nominated by a major political party in US history, while Senator Bernie Sanders’ supporters made clear how inspiring and important his run had been. “We wouldn't be talking about income inequality at all without Bernie,” Lisa Kermish, a member of UPTE’s executive board who also served as a Sanders’ appointee to the Democratic Party Platform Committee, told the Monday Memo. “Nobody would know anything about the TPP [more here]. We wouldn't have an agenda that includes $15 minimum wage, abolishing the death penalty, a public option for health care, debt-free public higher education, getting rid of for-profit prisons, or preserving earned pensions,” she said. UPTE and its national union, CWA, were among the first unions to endorse Sanders. Monday Memo last week reported on UCSF’s CFO, Mark Laret, who has come under fire because he sits on the boards of two medical corporations that between them do millions of dollars of business with UCSF – and because he was paid a tidy $5 million by those companies for his service. This week, UC settled two conflict-of-interest lawsuits for $8.5 million filed by patients who say they suffered harm after a UCLA surgeon administered products by a company from which he had already received tens of thousands of dollars. Following the deaths of two of its students in terrorist attacks in Dhaka, Bangladesh, and Nice, France, UC is considering rolling back some parts of its study abroad program, according to Reuters. About 5,600 students take part in the program each year. Despite the controversy surrounding UC Davis chancellor Linda Katehi – which included UC president Janet Napolitano’s suspension of Katehi pending investigation for ethics violations – UC Davis has reported the largest annual donation total in its 108-year history. UCD took in $226 million, a 23 percent increase over the previous year.